The International Committee of the Red Cross has described the 1.5 million Palestinians living in Gaza as people “trapped in despair”. In a report, it said that a main cause was the continuing Israeli blockade. The report comes six months after the end of Israel’s military offensive in Gaza in which at least 1,100 Palestinians died. 13 year old reviews the Sony Walkman 30 years late. 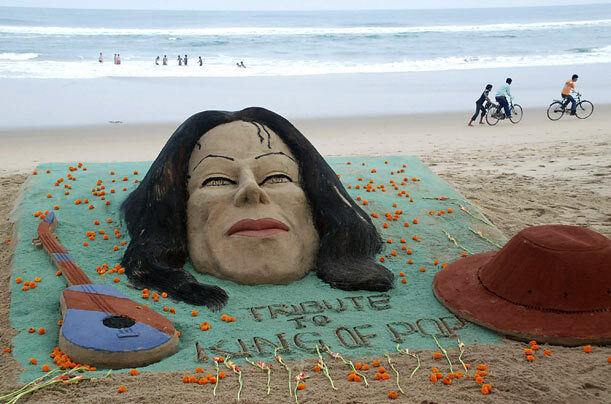 Sand sculptures of Michael Jackson, a guitar and his fedora hat, made by Sudarshan Pattnaik, stand on the beach at Puri, India. Historically and philosophically, however, AMA’s opposition is hardly newsworthy. Despite a lofty reputation and purported commitment to universal coverage, AMA has fought almost every major effort at health care reform of the past 70 years. The group’s reputation on this matter is so notorious that historians pinpoint it with creating the ominous sounding phrase “socialized medicine” in the early decades of the 1900s. There’s more of this sordid history, at the link above, including the AMA’s ads featuring Ronald Reagan (the B actor) aimed at blocking Medicare (see video below), labelled “socialised medicine”. Bill Maher calls for Nader, Kucinich and Chomsky! Maher points out that the Democrats are a centre-right party while calling for Chomsky, Nader and Kucinich to be taken seriously. Goodman says somewhere that he finds abstract entities difficult to understand. And from a psychological viewpoint it is certainly his dislike and distrust of abstract entities which leads him to propose an ontology from which they are omitted. Now a misogynist is a man who finds women difficult to understand, and who in fact considers them objectionable incongruities in an otherwise matter-of-fact and hard-headed world. Suppose then that in analogy with nominalism the misogynist is led by his dislike and distrust of women to omit them from his ontology. Women are not real, he tells himself, and derives great comfort from the thought — there are no such things. This doctrine let us call ontological misogyny. There are various forms which such a doctrine may take. The misogynist may follow the example of Ryle and say that the world of women has no independent existence, it does not exist in addition to man’s world but is an aspect of it; and though it may be convenient to speak of women independently, it is also misleading, and actually one should not ask such questions as whether women exist. But if this doctrine stands in isolation and does not affect the circumstances under which he agrees to my assertion that there is a woman in the room, or admits that some women have made important scientific discoveries, then it is clear that the denial of ontological status to women is only a matter of psychological comfort to the misogynist and has no further significance. Instead of this the misogynist may take the more profound course which follows Goodman and Quine, attempting to construct a comprehensive theory that is adequate in general for purposes of understanding and communication, but at the same time avoiding ontological commitment to women. It is an interesting logical question how far such a theory is possible (without inconsistency with experimental and observational results). I think it may have at least as much success as has attended the corresponding search for a nominalist theory. Just as propositions are replaced by inscriptions in order to avoid ontological commitment to the former, so a woman might be replaced by her husband. Instead of saying that a woman is present, we might speak of men as having two kinds of presence, primary presence and secondary presence, the observational criteria for secondary presence of a man being the same which the more usual theory would take as observational criteria for presence of a woman. And similarly in the case of other things that one might think to say about women. Certain difficulties arise over the fact that some women have more than one husband and others none, but these are no greater than the corresponding difficulties in the case of propositions and inscriptions. Actually the task might be lightened by taking advantage of the fortunate circumstance that every woman has only one father. And for this reason ontological misogyny is a doctrine much easier to put into satisfactory nominalistic theory, and probably more logical order than is the Quine-Goodman finitistic nominalism. But the question of the logical possibility of such a theory must be separated from the question of the desirability of replacing the ordinary theory by this ontologically more economical variant of it. Quine and Goodman emphasize the economy of nominalism in supposing the existence of fewer entities. But the economy which has commonly been the concern of the logician, and of the mathematician dealing with foundations, has been simply economy of assumption, which might be thought to include (among other things) economy of ontological assumption, but certainly not as its primary or most important element. Surely there are other criteria by which to judge a theory. And though we may be obliged to grant that the ontological misogynist has made a successful application of Ockham’s razor, in that he has reduced his ontology without losing the adequacy of his theory, we may still prefer the more usual theory which grants existence to women. To return to Quine and Goodman, it is possible, even likely, that the failure of their program will demonstrate the untenability of their finitistic nominalism. But the success of their program, like that of ontological misogynist, would leave us to choose between the rival ontologies on other grounds. It is only in the former case that Quine and Goodman could be said in any sense to have settled the nominalist-realist controversy. 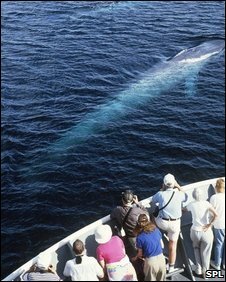 But it is in any case a major contribution to have clarified the meaning of the dispute, by putting the opposing doctrines on a sounder basis and showing their relevance to logic.